The other day I was having lunch with two other fundraisers. Each of us started new positions within the last year; we were chatting about what is new and different, what is working well, what could be improved. We all work in the healthcare arena: one in a national cancer organization, one in a community hospital, one in a disease-related organization. We face similar challenges and opportunities – each of us wants to increase our capacity around major gifts, we all want to engage our donors better. For my part, when I arrived very few letters – only those above the $500 (major gift) level – received a live signature. With only about 2,500 active donors and members, I didn’t think my organization could afford to “phone it in” by just merging up letters without any personal touch, note or interest. Worse, in my opinion, was that the memorial donors never got a real signature. Why? At this organization signing letters by hand “takes too much time.” I’m a long-time fan of writing notes on donor thank you letters in addition to the signature – something personal that connects with the donor. And if I know the donor, or know this is a second gift this year, why not mention it? As the three of us talked, it came down to the fact that thank you letters becoming a process, rather than an appreciation. Seth Godin spoke about the issue of dehumanizing. When charities ensure letters are “turned around quickly” after the gift is received and that becomes the focus of the thanks, process begins to supplant appreciation. The thank you letter process is not, in itself, bad… it guarantees (almost) that each donor is thanked. But that process can quickly become dehumanizing, removing grace and gratitude from what likely began as a moment of joy for the donor. Lots of trusted fundraisers point to the importance of thank you letters. Penelope Burk says that they are the first step to a next gift. Katya Andresen weighs in. Erica Mills has advice. Lisa Sargent… well, enough said there! Do you think about your thanks before you make your ask? 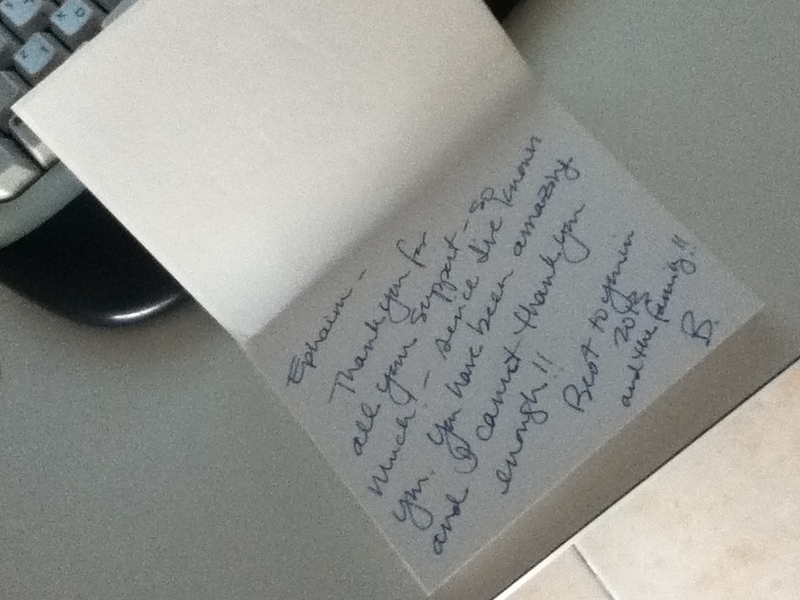 When planning direct mail campaigns, you should work on the thanks as well as the solicitation. You and your team put in a lot of effort to create strategies for major gift donors, craft direct mail solicitations, or write proposals. Why should the effort to thank be any less? If your organization can create thank you letters that are personalized and express thanks from the heart, they will be the first step in your donor stewardship. True appreciation cannot be manufactured from a process. It must come from the heart. I need a “love” rather than “like” button here! You put it so perfectly! I’m all about getting the process organized so that, as you say, no one gets forgotten. (I’m at that stage in my new job). But for me, getting systems (and automation, like merges) in place is the first step, not the end. And I love what you say about writing the thank you at the same time as the appeal. How much sense does that make? Complete sense! Thanks for a great post, Beth! Thanks, Mary, and so glad you loved it. There has been lots of talk about this, then when you get down to it in your own organization, there can certainly be a number of obstacles. Letters I believe will be great for the donors are not always as enthusiastically received… some of the same challenges we face when supplying direct mail copy. And when you are new in a place (as you are) there is also the challenge of not being able to “hold everything” while you re-write every letter. See you on Twitter! Thanking for the sake of thanking isn’t meaningful. The idea is to wow the donor, and make them feel special. 10 years ago, a letter from the CEO with even the person’s first name merged in would have wowed people, because it was harder to do and not the norm. Nowadays, people expect a certain baseline level of personalization (many posts written against “Dear Friend” – right Mary C?) An automated letter with NO personalization at all can almost be considered junk mail. It may not always be a signature, it could be something customized in the letter which acknowledges the person’s relationship with the organization – but it should speak to them directly. If it doesn’t, it will be received that way – “This doesn’t speak to me, I’m just 1 out of 1,000 in a mail merge”. Rickesh – I so agree with your comments! There is a balance between workload and meaningful connection. It is also a reason I like to ensure that I write personal notes from ME to donor/ambassadors and the like… just so they get a personal thanks that has nothing to do with a gift. Such a great point you make in your blog post! We all want to know that we are valued and appreciated. A cursory “thanks” or a mechanical signature lacks meaning and doesn’t feel personal. When someone shares why they’re thanking, it means so much more. They’re communicating “I appreciate you” and “You’ve had impact”. It was good to “see” you through your blog post. I love the importance you give to letting people know the difference they make to you. I hope you’re doing well. This may seem a little abstract, but your post made me think about the many different things we automate, to be more efficient, more timely, more “responsive”. It is. Authenticity. Connecting with the donors with the eyes and heart and at the points of engagement with your nonprofit. You know all about it!